One form of metamorphosis (morphing) is 3-D morphing (or shape morphing), which involves smoothly changing a 3-D source object (model) into a target object. We present a new approach to this task, that employs an active deformable surface which starts at the source shape and smoothly changes into the target shape. (See Breen & Whitaker 2001, and Whitaker & Breen 1998). This deformation process is described by the optimization of an objective function that measures the similarity between the target and the deforming surface. We represent the deformable surface as a level set (iso-surface) of a densely sampled scalar function of 3 dimensions. The sampling produces a regularly-spaced rectilinear volume dataset. Such level set models have been shown to mimic conventional parametric deformable surface models by encoding surface movements as changes in the grey-scale values of the volume. A well-founded mathematical structure leads to a set of procedures that describes how voxel values can be manipulated to create deformations in the level sets. The result is a voxel-based modeling technology that offers several advantages over previous methods, including support for a wide range of user input, no need for parameterization, flexible topology, and sub-voxel accuracy. This work is based on the image morphing strategy, which consists of two distinct steps: global geometric warping and blending. The former step utilizes a coordinate transformation that maps the source model into approximately the same shape and orientation as the target model. The coordinate transformation can take a variety of different forms, among the most successful of which has been shown in the literature to be a combination of a rigid transformation and a non-rigid, spline-based coordinate map. However, our major concern is the second step, blending. A blending completes the morph by ensuring that any discrepancies that remain in the images/volumes after the warping are gradually removed over the course of the morphing process. Our work focuses primarily on developing a superior method for the blending stage, one which reduces the amount of user input required to produce an acceptable morphing result. Indeed, the proposed level set approach to shape metamorphosis will produce a reasonable morph with virtually no user input. Given this technology, user input can be incorporated in an incremental fashion starting with a minimal amount and proceeding with progressively more until a satisfactory result is achieved. Our level set approach to 3-D model morphing provides several advantages over other 3-D morphing algorithms. Level set models are active, since their underlying motion is defined algorithmically rather than interactively. The amount of user input may range from virtually none to a full 3-D warping description of the process, and the results are reasonable with any intermediate amount of user input. Level sets do not utilize parameterization, so our method will not lead to any limitations that usually come with parameterization, e.g. a limited set of possible shapes and the need for reparameterization after undergoing significant changes in shape. This lack of parameterization allows for a change of topology of the object while morphing. For example, the object may split into pieces to form multiple objects, or vice versa. Finally, both the scan conversion and deformation stages of our morphing approach produce models with user-defined sub-voxel accuracy. The proposed strategy for object metamorphosis is based on the following principle: Shape metamorphosis is the process by which one object seeks to resemble the other. This philosophy raises two questions. First, what is the metric by which we can quantify the similarity of two objects? Second, what is the process by which one object seeks to optimize that metric? It turns out that even very simple answers to these questions produce very powerful algorithms for shape metamorphosis, with a great deal of opportunity for future enhancement and refinement of the resulting algorithms. This result confirms that local maxima exist only where the surface S lies on the zeros of . Thus, for a local maximum with respect to we can conclude that each connected component of is either exactly matched by a corresponding piece of or it is missing, i.e. there is no corresponding component to . This formulation suggests a strategy for shape metamorphosis: Construct a family of objects (with = ) that evolve according to a hill-climbing strategy, and maximize . If initialized in such a way that all of the connected components of have some overlap with , then the deformation will gradually seek the global maximum, which is the target . The intermediate shapes in depend, of course, on the choice of the function . In order to avoid numerical difficulties, it should be continuous. Furthermore, should reward shapes that are similar to the target but offset by some small distance. A natural choice of is a signed distance transform of the target surface SB or some monotonic function thereof. Thus, if we let a function DB be the signed distance transform, then , where f(0) = 0, and f'(a) > 0. By tuning f, one can control the way the metamorphosis behaves when intermediate surfaces are far from the target. If f(a) = a, then St contracts or expands with a magnitude that depends on the signed distance to the target. As discussed earlier, this low-level process is meant to address the blending stage of 3-D morphing. It can be combined with some higher-level process that accounts for "semantic" aspects of shape correspondence. Only users can supply such semantic considerations. In the event that the user is not able or willing to define every important correspondence between two objects, some other method must "fill in" the gaps remaining between the source and target surface. To this end, we propose the use of free-form deformations, implemented with level set models, to achieve a continuous transition between shapes that result from the underlying coordinate transformation. In practice, the strategy of shape metamorphosis by surface deformations described above must be computed using some specific surface representation. Ideally, we would like the surface representation to be as general as the underlying theory. For this we use the method of level set models, which is a technique for modeling surfaces as isovalues of a densely sampled scalar function of the domain. Surface movements are encoded as changes in the grey-scale values of the voxels. Using level set models, we can compute goal-driven deformations on surfaces without any explicit surface representation. Level set models represent a set of surface points S as an isosurface of , which we will call the embedding. The complete deformation strategy is as follows. First, initialize a volume so that the kth level set is, approximately, aligned with SB. For all our work, we will use the zero-set as the level set model, using the discrete distance transform of SB. We use this initialization to solve the initial value problem given by the preceding equation, using the distance transform of the target as the , which forces the level set model toward the goal. We solve this equation using finite forward differences. When the model is sufficiently close to the target (a threshold on the RMS distance to the target), the process stops and the metamorphosis is complete. The specific steps of our level set morphing approach are (1) 3-D scan conversion of source and target objects, (2) application of coordinate transformations, (3) level set deformation, and (4) polygonization and rendering. This step produces the two volume datasets needed for the next stages. The first volume represents the source object and provides the initial conditions for the deformation stage. The second volume is a sampling of the signed distance transform of the target object, which is used to drive the deformation process. where 0 1 parameterizes a continuous family of transformations that begins with identity, i.e. x = T (x, 0), and smoothly becomes the user-defined transformation at T (x, 1). The parameterization is utilized during polygonization and discussed later. For this work, we have developed a software tool that allows a user to interactively position, rotate and scale the source and target objects in order to produce the transformation T. A generalized warping, with extensive user input, may also be utilized to provide an even more detailed control of the process. Step (3) (level set deformation) was described in the previous section. Finally, the viewing of the morph can be achieved by extracting a polygonal iso-surface (using the Marching Cubes algorithm) from each volume produced by the level set deformation process. The polygons are rendered to produce a series of images, which are then combined to produce an animation. The algorithm used to color shade our level set models has been described in Breen, Mauch & Whitaker 1999, 2000. 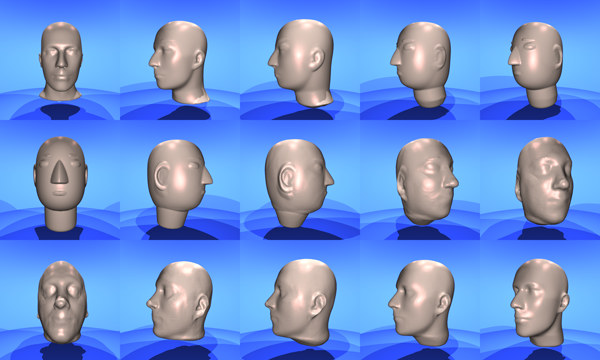 Level set morphing may also be combined with a variety of 3D scan conversion algorithms in order to produce a technique for morphing between different types of geometric models. (See Breen et al. 2001) The example below demonstrates a morphing sequence between three different heads that were originally represented by a polygonal mesh, a Constructive Solid Geometry model and an MRI scan. Still images and animations from our morphing sequences may be found at the following URLs: http://www.cs.drexel.edu/~david/morph_results.html. Last modified on September 15, 2004.